This is simple, delicious, quick & inexpensive — great for a light meal or as an appetizer. When I was a kid, this was served by Gopal, our cook, hot from the oven at many of our diplomatic cocktail parties. He would present it cut into 1-inch square pieces, and it was devoured by the guests. 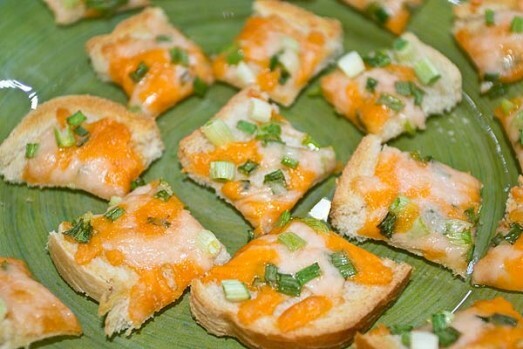 In a medium sized bowl, combine the grated cheeses and the chopped green onions. Turn on the broiler and let it warm up for a couple of minutes. Lay the bread slices on a baking tray. Cover them with the cheese and onion mixture. 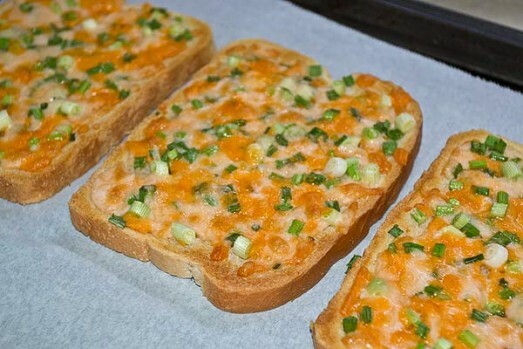 Make sure the cheese and green onion mixture covers the entire slice of bread. 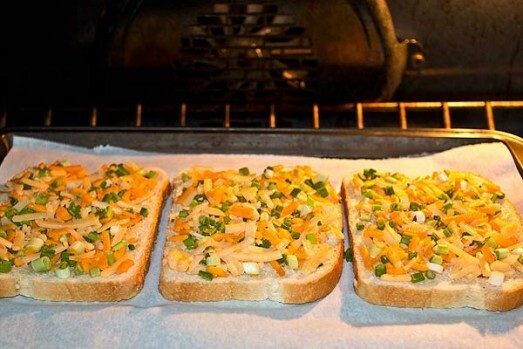 Now, place the slices of bread covered with the grated cheese mix under the grill (about six inches away from the broiler) and broil until the cheese melts and is covered with golden-orange/brown spots. Keep an eye on things because it cooks really fast. Note: the top will be crispy but the bottom will be soft. You’ve got to have a cheese with just the right melting characteristics. Dry, crumbly, fresh cheeses like goat cheese won’t melt properly. Try grated cheddar cheese and a little grated Parmigiano Reggiano cheese. It will be a little saltier. Slice the edges of the bread off if serving as an appetizer – it looks way better. Before serving, with a sharp knife cut each slice into approx. 1″ squares. If serving for lunch, try with a tossed spinach salad with a balsamic herb dressing such as this one.